Fall is fast approaching and my love for squash and pumpkin will be coming on strong!! This Sage Havarti Butternut Squash Lasagna was also made because of my abundance of sage. Plus, I love the combination of squash and sage together. This is a rich and divine lasagna that is very entertaining worthy. It is vegetarian so can be served on it’s own or as a side to many meat entrees. I have had a long love affair with this Mushroom, Spinach and Four Cheese Lasagna, another vegetarian pasta option and one that we have made countless of times. Don’t get me wrong, I do love a traditional lasagna with meat but there are so many other ways to enjoy lasagna too! This delicate but divine lasagna is layers of sage infused butternut squash, along with havarti cheese and bechamel sauce. It is a creamy, cheesy wonderfully rich pasta recipe. This dish will rapidly become a new favorite for your fall entertaining. When I was doing my research to make this recipe I saw some of the recipes asked for you to peel a butternut squash. Well, I thought it would be way easier to bake it, cut side down and then just simply scoop out the squash. That was a very easy alternative. On that same baking sheet I popped the sage in to crisp it up and release some of it’s flavor. All of the elements of this lasagna work fabulously together. 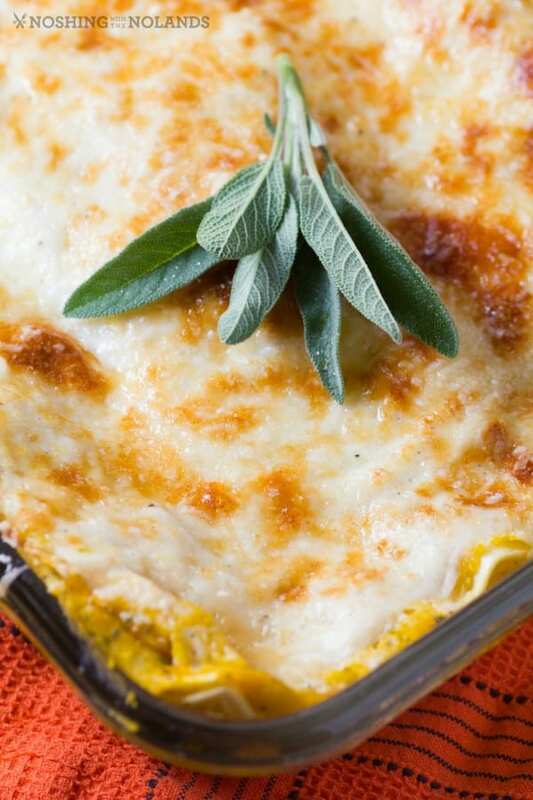 The bechamel, havarti and squash with sage are a dream team and make the best lasagna ever!! 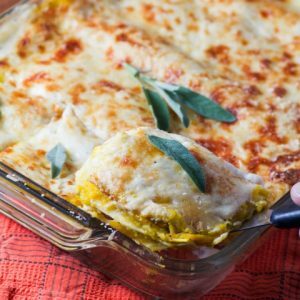 A rich and delicious Sage Havarti Butternut Squash Lasagna that is perfect for fall and very entertaining worthy! Preheat oven to 350F. Bake the squash by first slicing it in half and cleaning out the seeds. Spray with cooking spray on the cut side and place face down on a cookie sheet with sides. Bake for 35-50 min. or until tender. Pop the sage leaves in after on the same cookie sheet. Spray with cooking spray and bake 3-4 min. until fragrant. Leave both to cool enough to handle. Meanwhile to make the bechamel sauce, melt the butter and add the flour stirring well. Cook for 2 min. Slowly add in the milk while whisking. Let the mixture come up to a simmer, whisking constantly until it thickens. Season with the nutmeg, salt and pepper. Set aside. Whirl the cooled butternut squash in a food processor with the butter, salt and pepper and sage leaves. In a 9x13" pan pour a small amount of bechamel sauce in the bottom and spread out. Add a layer of pasta noodles. Spread a layer of the squash puree and then top with cheese in a single layer. Spread out another layer of bechamel and repeat layers two more times ending with the bechamel. Top with the parmesan cheese. Bake for 35-45 min. or until heated through and browned on top. Broil for a few minutes if needed. Now this sounds so good! I would certainly try this but need to pick up some harvarti first! I love butternut squash lasagna. This one looks so much better than the one I made, I am totally trying this one next. I love using squash in my recipes! Sounds like a delicious and smarter way to eat lasagna! I love having lasagna, but I’ve never tried it this way. Sounds really interesting. I’ll have to give this a try. I love that it’s a healthier option too. I am a huge fan of sage, and grow it in the garden and in pots by the door. Now is the time for all things sage. I just cooked a butternut, and might make some gnocchi with it, but must try this recipe as well..the havarti is the big change for me…sounds like a super combination. That looks absolutely amazing! Believe it or not my kids love squash and havarti! Their so going to love this recipe! I have no doubt that my hubby would really enjoy this. I don’t do much with squash because I don’t really care for it so he goes without most of the time. This looks yummy! I am always looking for new ways to use squash and this right here definitely has me intrigued. 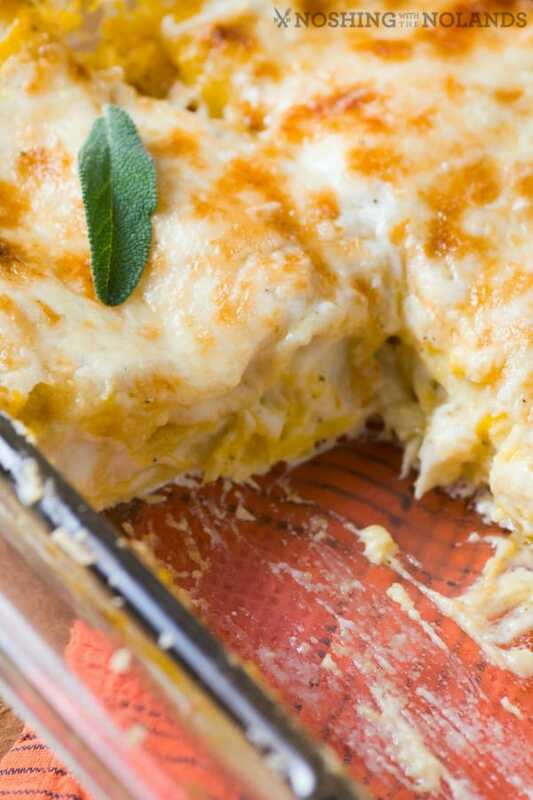 This Sage Havarti Butternut Squash Lasagna looks so delicious and easy to make. I will have to give this recipe a try for dinner this week. 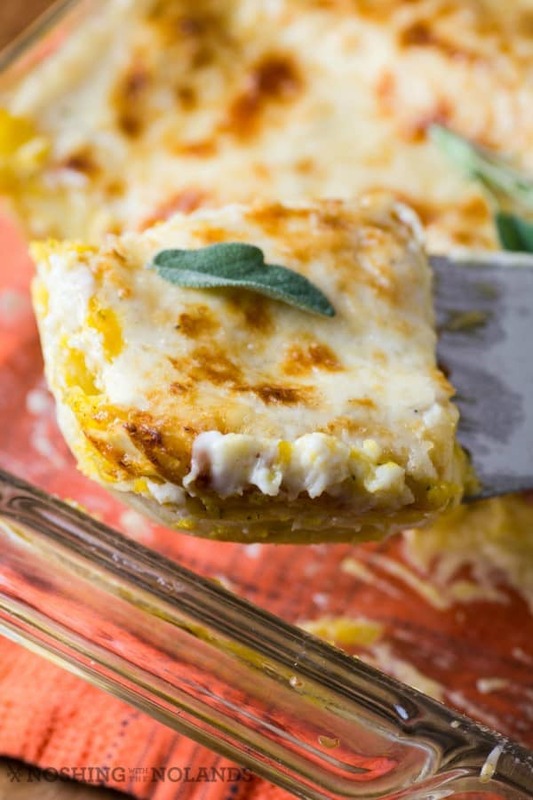 I am excited to try this Sage Havarti Butternut Squash Lasagna recipe. It looks so delicious I know my family will love it. This Sage Havarti Butternut Squash Lasagna look amazing. I am so excited to give it a try. I will have to add it to the menu for this week. This looks awesome and so easy to make! Definitely worth a try! This recipe sounds fantastic! I can not wait for all of my fresh squash from the garden this fall. This sounds so good! We actually got a few squash from the garden recentily, and we have sage too! I may have to try this tomorrow! Perfect timing sense I’ve been debating what to do with them. I love having lasagna, but I’ve never tried it this way. Sounds really interesting. I’ve done one with zucchini before. That sounds wonderful, and I’m such a fan of butternut squash. I absolutely know I will love this and the family will too. That looks amazing! I love lasagna- whether it’s spaghetti sauce and cheese, veggie lasagna or this butternut squash one. This recipe is perfect for fall! This look amazing. I wonder if I could get my husband to eat it. Don’t you love picky eaters? Okay, it’s official – I’m hungry! This looks absolutely divine. I love this modern spin on a traditional Italian dish. I’m going to have to add this to my weekly meal plan. Mine is in the oven right now, and if it tastes as good as the bowls did that I licked (the bechamel and the butternut mixture) it’s going to be a regular on my menu. I got lucky and found packages of sliced Havarti at my Aldi grocery store. 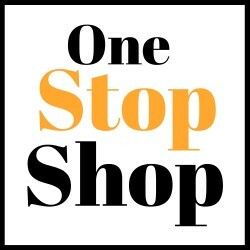 Sure made life easier and cheaper. I so hope you enjoy it Jane, come back and tell me what you think. It was divine and I am making it again today, It is all ready to go in the oven. I didn’t have enough noodles and I was at Sprouts and all they had was oven ready whole wheat so that’s what I got so that should be even better! Can’t wait for it to come out. I gave some of the last batch to a neighbor and she loved it and some to my daughter and she loved it too. I am so happy Jane, we really loved it also. Thanks for taking the time to tell me.